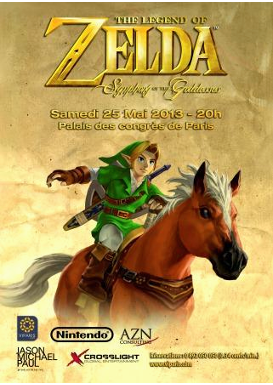 The Legend of Zelda: Symphony of the Goddesses tour is on it way to Paris! Dated for May 25th of 2013, the concert will be coming to the Palais des congrès de Paris and tickets are on sale for € 61.50 to € 111.50. Earlier this month it was announced that the concert would be coming to London, with other dates in Australia already booked. It seems like a safe bet that the concert will likely hit other venues in Europe later on this year. The next concert date takes place tomorrow (Saturday the 26th) in Milwaukee, Wisconsin. The concert is nearly sold out, with only individual tickets in the balcony still available for sale. This particular concert is a bit special to us here at Zelda Dungeon as we will be in attendance! 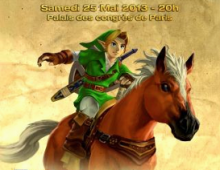 Several staff members from Zelda Dungeon, along with our sister website GenGAME will be there. We’ll surely have our cameras ready and we look forward to seeing all the great cosplayers in action. If you are attending tomorrow, maybe we’ll see you there!